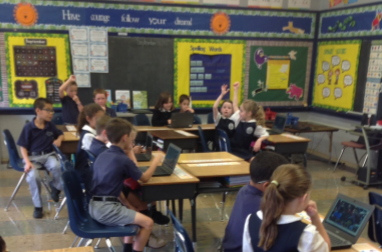 Starting in 2017, each student has their own Chromebook to use on a daily basis. I try to incorporate various technology features into the classroom everyday. One of my favorite things to use is Google Hangout, exposing the students globally by connecting with other schools around the world on Character Day, Dot Day, Global Read Aloud, and Projects by Jen. This gives my students the opportunity to meet other students in different parts of the world and learn about their cultures. We use Google Earth to find their location and compare where we are on the globe. Once we make a connection, we create a group project shared through G-Suite or Padlet. Once we finish our shared project, our class will connect again through Google Hangout. I love trying new technology techniques in my classroom because the children are so adaptable to it. Loren loves decorating her classroom. Each year she chooses a completely new theme. In years past, the themes have been, "Away at Camp", "A Train Ride Across America" and this year's is "King of the Jungle". Check out the Jeep and the Giraffe in the pictures below. When she isn't coming up with creative new ways to engage her students, she loves spending time down the shore with her family. AOPTech would like to thank Ms. Loomis for sharing her classroom expertise with us. ​We also would like to thank Ms. Burke for sending us the nomination.